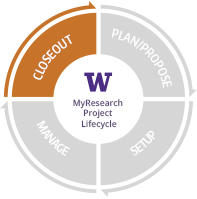 The Closeout stage begins when a funded project period ends or when all data have been collected and analyzed. It includes all programmatic and administrative activities related to completing the project. Closeout extends for as long as research and administrative records are retained and as long as results are being disseminated, often long after sponsors have considered the closeout period to have terminated. After Grant & Contract Accounting (GCA) receives all necessary financial information from the department, the budget can be reconciled and closed. GCA reconciles and closes the budget number. The Principal Investigator (PI) prepares a final invention report, according to sponsor requirements, and submits to the Office of Sponsored Programs (OSP). The research team, led by the PI, prepares and disseminates reports of the findings of the research project and provides a copy to OSP. The Equipment Inventory Office prepares a final equipment disposition report, according to sponsor requirements. Scientific/programmatic Closeout must comply with sponsor requirements that can include results dissemination, publication guidelines, and records retention. Make sure you know your sponsor requirements and have resources lined up to meet them. Submit all final performance documentation required by the sponsor no later than 90 days following the period of performance end date, unless the sponsor grants a no cost extension or a non-competing renewal. Administrative close out of the project must comply with sponsor and university policies. Submit final technical reports to external sponsors. Report any equipment acquired during the project to the Equipment Inventory Office. Report innovations to UW CoMotion. Maintain records according to record retention requirements. Review GCA pages for guidance on budget close-out processes.